Photo Caption L-R: Stephen Crawford (1999 Scholar), Helen Goodwin (1994 Scholar), Faye Sandwith (long time Honorary Secretary Nuffield Zimbabwe), Liezel Crawford (Steve’s wife), Rob Fisher (2002, and last Zim Scholar), Kelvin Meadows (Nuffield Canada Chair), Kathy Etheredge (Richard’s wife), Wayne Dredge (2014 Australian Scholar), Romee Fisher (Rob’s wife), Richard Etheredge (1966 Scholar), Jim Geltch (CEO Nuffield International and 1986 Australian Scholar) and Jeff Kockott (2001 Scholar). 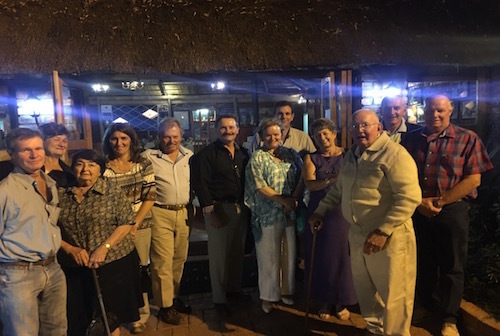 Through the efforts of 2014 Nuffield Australian Scholar, Wayne Dredge, and 2002 Zimbabwean Scholar, Rob Fisher, five Nuffield Zimbabwean Scholars, wives and the organisations long time secretary and honorary member, Faye Sandwith, met in Harare for dinner on 1 October 2016. Apologies were received from Trevor Gifford (1995) and Doug Bruce (2002), who were both out of the country. "What a delight last night was. Nothing high powered but really mind blowing to have you amongst us and in the Nuffield way getting everyone to talk. Really good for the soul. Thank you very much." "Thank you all for coming out. I was horrified that you were staying in a hotel. Please in future contact us and we would be delighted to have you to stay. However, it was a feat in itself just getting some of us together for the evening." Nuffield International plans to make this get together an annual event. Having a cohort of Nuffield Scholars in Zimbabwe, will make our attempts to establish a Nuffield scholarship program across the African continent, much easier to achieve.